Last year, Portland International Airport and several other airports followed the lead of airlines in tightening the leash on what consitutes an ’emotional support’ animal and the expected and acceptable behavior of pets in the terminals. The move came in response to increase incidents of aggressive pets and, in some cases, of pets biting and attacking passengers and employees in airports. Now Tampa International Airport (TPA), which last May was in the news when a dog traveling as an emotional support animal gave birth to puppies in the terminal, has joined the herd in stepping up its enforcement of restricting non-service animals at the airport. The aim of TPA’s new policy is reducing injuries to pets and people as well as enhancing cleanliness and sanitation at the airport. Starting this week, TPA will begin educating pet owners about the airport policy which, it notes, has been in place for decades but loosely enforced. The policy states that traveling non-service animals (i.e. pets) must be properly confined in a pet carrier or controlled on a leash when they are in the airport. In addition, pets that are not traveling, such as those greeting arriving passengers in the Main Terminal, are not allowed at TPA. At the end of March, pet owners who are not following the rules will receive warnings and there could be citations for non-compliant guests. 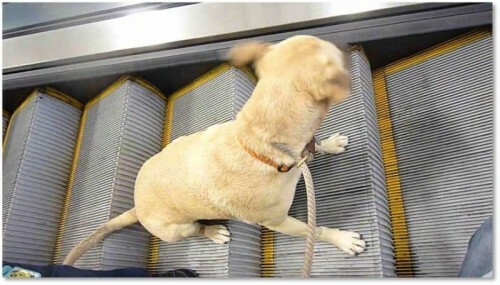 TPA’s policy enforcement was endorsed by the Humane Society of Tampa Bay, which says the policy is a necessary measure to reduce animal incidents such as paw injuries on escalators. What do you think of this trend? Do you bring your pet to the airport? Have you seen witnessed pets misbehaving at airports? A pet traveling as an emotional support animal gave birth to puppies last year at Tampa International Airport. Will this emotional support chicken fly? Misbehaving emotional support animals on airplanes ruffle lots of feathers lately and have caused carriers to tighten up their rules. But the emotional support chicken that Popeyes let fly at its Philadelphia International Airport location (in Terminal C) is designed to get laughs and to fill stomachs. On Tuesday, Popeyes rolled out a special fried chicken meal (a 3-piece tender combo) that comes packaged inside a cardboard carrier that is shaped like a chicken. The cocky campaign is a nod to the wide variety of animals – including peacocks, pigs,monkeys and spiders – that passengers try to insist must fly in the cabin for free because they are providing important emotional support for their owners. Popeyes is going for giggles with this emotional support chicken, introduced just in time for the stressful holiday travel period. Stuck at the Airport is declaring Popeyes’ emotional support chicken a top contender for the airport amenity of the week. Delta tightens leash on emotional support animals- again. Delta Air Lines is issuing a new round of rules for service and support animals . Don’t be surprised if these rules are adopted soon by other airlines. Delta’s new policy goes into effect December 18. Under the new rules, service and support animals under four months of age will be banned from any Delta flight. Delta will also no longer allow emotional support animals – of any age – to be booked on flights longer than eight hours. If you purchased a ticket before December 18th and have requested to travel with an emotional support animal, Delta will still allow you and your emotional support animal to travel. Come February 1, 2019, however, emotional support animals will not be accepted on flights longer than eight hours, regardless of booking date. “These updates support Delta’s commitment to safety and also protect the rights of customers with documented needs, such as veterans with disabilities, to travel with trained service and support animals, ” said John Laughter, Senior Vice President – Corporate Safety, Security and Compliance. Delta said the updated policy comes on the heels of an 84 percent increase in reported incidents involving service and support animals from 2016-2017. Those incidents include urination/defecation, biting and an attack by a 70-pound dog. Delta also notes that its updated support and service animal age requirement aligns with the vaccination policy of the CDC and the eight-hour flight limit for emotional support animals is consistent with principles outlined in the U.S. Department of Transportation’s Air Carrier Access Act. The full policy, including rules about what kind of animals can be considered service or emotional support animals, is on the Delta website. The new rules don’t apply to animals traveling in the cabin inside closed carriers as pets on paid tickets. Southwest Airlines is the latest airline to tighten its policies on passengers traveling with trained service and emotional support animals. The new rules go in to effect Monday, September 17, 2018. Under Southwest Airlines’ new rules, each customer will only be able to travel with one emotional support animal (or ESA) and ESAs will be limited to only cats and dogs. During travel, the airline will always require each ESA to be kept in its carrier or be kept on a leash. Customers traveling with ESAs will continue to be required to present a complete, current letter from a medical doctor or licensed mental health professional on the day of departure. As part of these new policies, Southwest is also recognizing fully-trained psychiatric support animals (PSAs) as trained service animals. The airline said it informally accepted PSAs as trained service animals in the past. Now the airline will formally accept this type of service animal. PSAs are animals that are specially trained to perform a task or work for a person with a mental health-related disability. To travel with these animals, the airline will require only a credible verbal assurance. When it comes to traditional trained service animals, Southwest says it is going to adopt the DOT guidelines and accept only dogs, cats, and miniature horses. Southwest’s new rule announcement comes affter Alaska, American, Delta, JetBlue, and United have also updated their policies. What do you think of the new rules? Fair? Thinking of taking dog your pet or emotional support animal with you on your next flight? Be sure to check the airline -and the airport – rule books on that. As I describe in my ‘At the Airport’ column this month for USA TODAY, airports are following the lead of airlines and making new and more restricted rules for animals in the terminals. Below is a slightly edited version of that column. There were plenty of “Aw, that’s so cute” social media posts last month when Eleanor Rigby, one of two service dog vest-wearing golden retrievers accompanying a passenger to Philadelphia on American Airlines, went into labor and gave birth to eight puppies in a gate area at Tampa International Airport. No one was charmed, however, by the report a passenger at Los Angeles International Airport posted last February about a woman who replied “They have people for that” when asked if she planned to clean up after her dog did its ‘business’ on the airport floor. Yet both stories are examples of a wide range of animal-related incidents that are forcing airports to expend extra resources and causing them to rethink policies governing animals in the terminals. In the Tampa airport puppy case, cute became controversy when animal rights advocates and people with certified service animals began questioning if the vested dogs were legitimate service animals and asking why a very pregnant dog – be it a certified service animal, emotional support animal or pet – had been allowed to fly so close to its due date. TPA officials point out that airports have no say over the animals that airlines allow on board. “We were just there to help with the situation and are happy the puppies were delivered safely,” said TPA spokeswoman Emily Nipps. Tampa International Airport hasn’t yet tallied up its exact costs for having paramedics, operations, communications and maintenance staff spend several hours attending to Eleanor Rigby and her new puppies during the airport delivery, “But having paramedics assisting a dog in labor could have potentially impacted a medical emergency on another side of the airport,” said Nipps. As had been widely reported, airlines have seen a sharp rise in the number of animals traveling on planes. Some are ticketed pets, but many are pets that have been flying for free thanks to loopholes in rules governing the transport of emotional or psychiatric support animals. American Airlines reported a 40% increase in the number of service and emotional support animals on flights between 2016 and 2017. United Airlines cited a 75% increase year over year. Like airlines, airports have had to make accommodations for all the extra animals and, like airlines, airports have been logging increased instances of pets and emotional support animals that are untrained, unruly and dangerous to others in the terminals. “We find them making messes on the airport carpet, interfering with the airport’s working dogs and, on occasion, biting other dogs or passengers,” said Kama Simonds, spokeswoman for Portland International Airport. Last December, a 5-year old girl ended up in the hospital after being bit in the face by an uncrated dog waiting for a flight with its owner at Portland International Airport. And a local TV station filming for a report on dog issues at PDX caught a schnauzer in the act of peeing on the airport’s brand new $13 million carpet. Many airports hope revised policies for flying with emotional support animals recently rolled out by American Airlines, Alaska Airlines, Delta, JetBlue, United and others will cut down on the number of animals in airport terminals. For its part, Airports Council International-North America, the membership organization which represents and advises most U.S. airports, is urging the Department of Transportation to clarify its rules. Currently, there’s confusion for both passengers and airports because airlines are covered by the Air Carrier Access Act, which recognizes emotional support animals, while airports are covered by a different act, the Americans with Disabilities Act, which does not recognize emotional support animals. “We want DOT to clearly articulate that airports are within their rights under the Americans with Disabilities Act to require anyone bringing an emotional support animal through an airport terminal to house those animals in carriers, so they don’t interfere with other passengers, employees, staff or other animals including service animals and TSA and police canine units,” said Thomas Devine, ACI-NA’s general counsel. DOT is currently taking comments through July 9 on proposed rulemaking related to traveling by air with service animals and ACI-NA will join the public and other industry groups in filing comments. But at least one airport is not waiting for DOT to get around to making its final ruling. After consulting with other airports, including San Francisco International, Detroit Metropolitan and Fairbanks International Airport, Portland International Airport plans to issue new rules aimed at clearly defining the different categories of traveling animals—pets, emotional support animals and service animals—and clarifying how the airport expects travelers to care for these animals while in the terminal. The new PDX rules will remind travelers that, like pets, the airport requires emotional support animals heading for airplanes to be in carriers while in the terminal. If too large for a carrier, those emotional support animals must be kept on short leashes. And if a traveler’s animal urinates or defecates on the floor at PDX, the new rules will require an owner to remain at the site until someone from the janitorial staff arrives. During July, airport operations staff at PDX will start spreading the word about the new rules. Come August, though, warnings and citations for bad dogs could be issued, with possible fines of up to $250.